Apart from eating healthy we should also endeavour to drink healthy too, because they both work hand in hand in our overall health as a human being. If we concentrate on healthy eating alone without giving much consideration on the kind of liquid intake we partake in, then there is bound to be flaws in our healthy living. In our quest to live a healthy life, we usually make selections on the kinds of food we eat, having in mind their nutritional values and the components in them that are detrimental to our health. All these is quite good. However, whilst doing this, we often forget to look at what we drink. Since a drink does not really make us feel any fuller, we tend to forget that they can be just as jam-packed with sugar as unhealthy foods, and may easily send our calorie count soaring. Now, we shall be looking at some important choices on how to drink healthy. We shall be listing some drinks that have the capability of increasing your calorie count and some important choice you should rather opt for. These are the obvious culprits, and the first to come to mind when talking about unhealthy drinks. I do not even need to tell you how bad these are, but just to remind you that there about 7 teaspoons of sugar in one small can of some sugary soft drinks. · Steep 2 tea bags of your favourite tea in 3 cups of boiling water. · Let it chill by putting it in the fridge or freezer. · Add 1 cup of sparkling mineral or soda water. 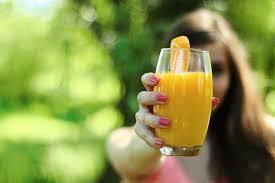 You might say that you will just pick freshly squeezed fruit juice instead of the ones with added sugar, right? Well, consider this: An apple only has about 3 teaspoons of sugar in it, but how many apples do you need for a glass of apple juice? 2-3 Apples only give you a medium sized glass of juice. This way, the sugar quickly adds up. Rather Drink: Lemon Water with some freshly squeezed lemon juice or some bottled lemon juice. Sports are healthy, so sports drinks are too, right? This cannot be more wrong. Although they claim to have added benefits like vitamins, minerals, and electrolytes – these are all artificial versions created in a laboratory. And the sugar content is just astonishingly high. Rather Drink: Coconut Water. It is a great drink to stay hydrated and keep energy levels up naturally. Although milk itself may be healthy, all the added sugar and ingredients that go into flavoured milk – not to mention the ice cream that goes into milkshakes – make it something to limit to special occasions. Rather Drink: Homemade flavoured milk and milkshakes. Stay away from store bought iced tea and iced coffee, as it is filled to the brim with sugar and preservatives. Rather Drink: Homemade Iced Tea or iced coffee. It is super easy to make, just make your favourite tea in a big jug, add some ice, and sweeten with some honey if needed. The same goes for the coffee. These are some few important choices on how to drink healthy, feel free to share the article to as many that may need it. And your comments are also welcomed.